Classic 45g - Take goodness wherever you go. Classic 45g - All the goodness of Loacker in a handy pack that goes wherever you go. For a quick snack no matter where you are, at any time of the day. In each pack, 8 crispy wafers to munch at work, at the gym, in your free time: a pleasure that's always at hand! In 5 irresistible flavours, instantly recognisable. An exotic pleasure that's simply divine! A heavenly coconut cream between deliciously thin wafers, wrapped in the finest milk chocolate and sprinkled liberally with fresh coconut flakes. Welcome to Paradise. The creamy pleasure of the finest milk chocolate reveals delicious crunchy pieces of toasted hazelnuts, while delicately crisp wafers conceal the mouth-melting sweetness of the smoothest of hazelnut creams: your palate will think it's in heaven. Wafer Quadratini Cacao & Milk 250 gr. 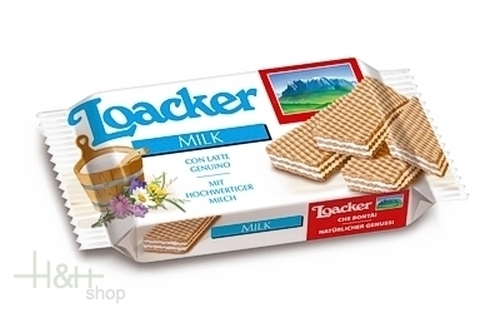 - Loacker 5,15 EUR / 2,34 €/100 gr. Gran Pasticceria Cappuccino Patisserie 100 gr. - Loacker 3,40 EUR / 3,40 €/100 gr. Gran Pasticceria Fogliette Dark Chocolate 100 gr. 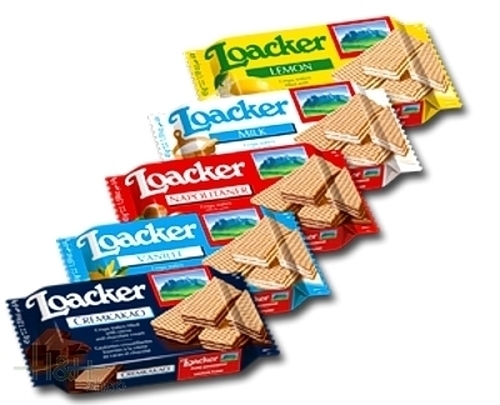 - Loacker 3,35 EUR / 3,35 €/100 gr.